The Lagos state Governor, Mr. Akinwunmi Ambode has signed into law, the state kidnapping prohibition bill, 2016 which prescribes Life Imprisonment or death penalty for the offence of Kidnapping and forceful extortion in Lagos State, meaning that the recently arrested kidnap kingpin, Chukwudubem Onwuamadike, a.k.a. Evans may get a life imprisonment or death penalty sentence. “This law imposes a penalty of life imprisonment for kidnapping for ransom. “The law stipulates that, where a victim dies in the course of kidnapping, the suspect is liable on conviction to death. “Security is of utmost importance to our administration, and we are confident that this law will serve as a deterrent to anybody who may desire to engage in this wicked act within the boundaries of Lagos State. “Our justice system will be required to execute this law in absolute and make sure that any criminal caught faces the full wrath of the law,” he said. Recall that Evans himself had advised kidnappers or intending ones to desist from the act, saying it does not pay any longer. He had said that if he can be caught, then nobody can escape the police being that the force has improved greatly in her anti-crime fight. 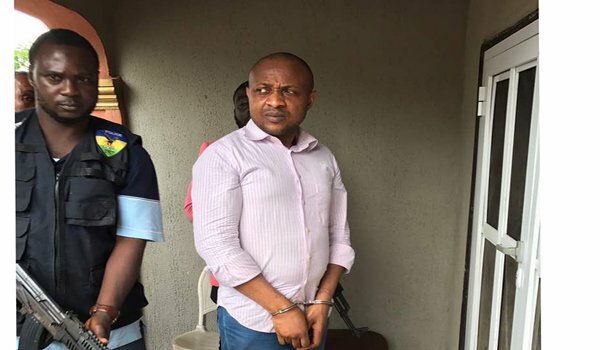 He gave the advise to other kidnappers while leading police operatives to two houses in Ejigbo and Igando areas of Lagos state where he keeps his victims until huge ransoms are paid. According to him, he keeps most of his victims in the two houses for months. He said he even pays up to seven hundred thousand Naira, (700,000) yearly for a three bedroom flat çells’ where the victims are kept. Upon departure from Igando area Evans had opined, “The Nigeria Police is not what it is used to be.